Did you know hair turns gray as early as your twenties? 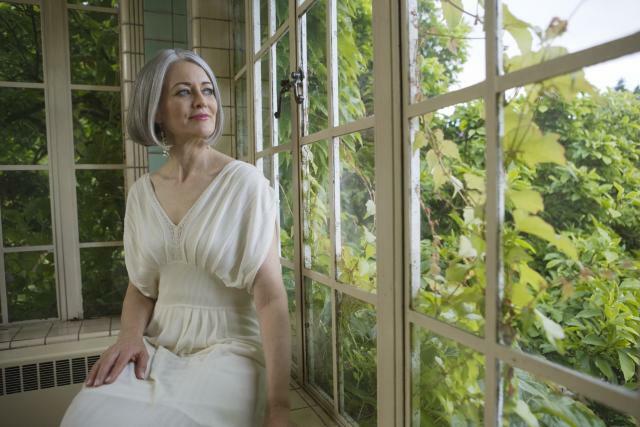 No matter how old you are when these silver tresses appear, it marks a transition in life. 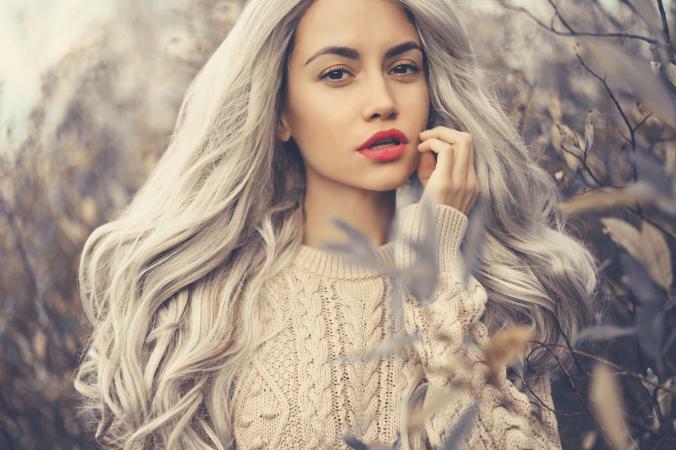 Whether your hair is naturally gray or dyed gray like Kylie Jenner or Rihanna, you can make your silver locks look gorgeous by incorporating these simple tips. For those with natural gray hair, embrace the right attitude first. Don't think of it as growing older. Think of it as growing wiser. Own it and love it. Just as silver jewelry can add accent and class to an outfit, so can your silver hair. In fact, gray hair can even become your best feature! Think of it as your precious metal, your crowning glory that makes a statement when you walk into any room. Take a cue from celebrities like Jamie Lee Curtis and supermodel Kate Moss. They have famously embraced their ageing bodies. Flaunt your gray hair with confidence and great panache as they have. When you feel good on the inside, it will show. Your gray hair needs special care. Whether you have natural or salon styled gray hair, you cannot treat it the same way as you would otherwise. Natural gray hair is drier than normal hair, and so is color-toned gray. To minimize damage, follow these tips. Wash your gray hair a few times a week. Remember, gray hair is prone to dryness and is fragile. If you wash your hair every day, then you are bound to lose more moisture out of your hair. Create a schedule or have fixed hair-wash days during the week. Use blue/purple shampoo just once a week. Gray hair that doesn't have enough moisture goes frizzy, making you look frazzled. Without regular upkeep, or with too much exposure to pollution, gray hair can turn a dull, yellow shade. Purple/blue shampoos are specially made to counteract dullness and bring out the silver. Be careful with that stuff, though. Overuse it and your gray hair can turn a weird lavender hue. Did you know that it can take up to eight years for a head of hair to go totally silver? So be patient. If you are in transition, work with your cosmetologist to develop a good transitional look. And try to resist the temptation to dye. Transitioning to silver hair can need a bit of reinvention, so try a new hairdo! Get a modern haircut that gives you a sharp look. Without it, you will look like Grandma. Pixie cuts are popular, and a cropped look works best if you are in transition or have fine hair. Break the you've-turned-gray-so-go-short-hair rules. 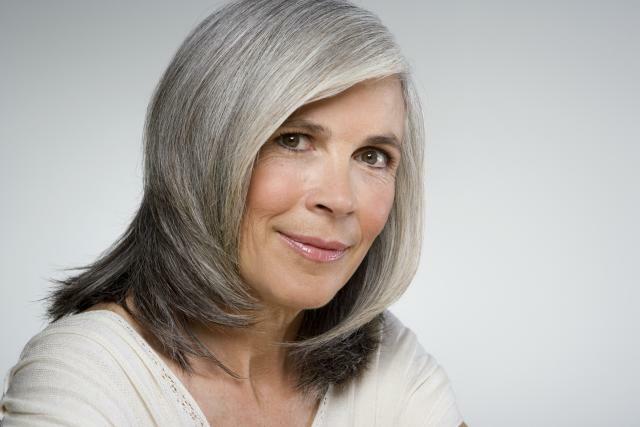 Long gray hair that is well-maintained looks just as gorgeous! 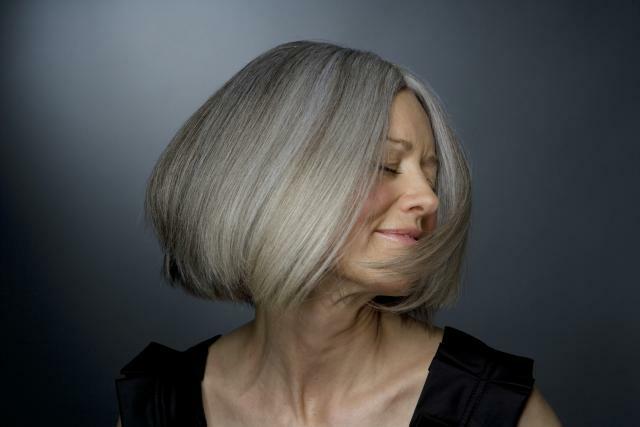 For shiny and gorgeous gray hair, avoid heavily textured cuts. This is because the heavy texture makes it hard to reflect light. It makes your gray hair look duller than it really is. A sleek, well-maintained head of hair always adds a hint of glamour and style, no matter what the color. Treat your hair just like a new accessory. Accentuate your new hairdo with proper wardrobe and makeup choices. Just think of your locks as you would a choice of silver jewelry and pick out clothes to match. In fact, any bright colors go well with silver or gray hair. Protect your gray hair while in the pool or when you are out in the sun. Swimming pools have large amounts of chlorine in the water. Chlorine from pool water can dull your gray hair. And so does the heat, harsh UV rays, or hair straightening tools. At home, consider sleeping on a satin or silk pillowcase. This will help avoid breakage of the fragile gray hair while you snooze. Invest in organic shampoo and conditioners that are sulphate-free, and do away with the commercial products that have harsh chemicals. Hard water is terrible for your gray hair, so wash your hair with filtered water instead. Deep conditionining once a week is a must. With all that dryness and frizz to contend with, you will need it, sister. You don't want your gray hair to look damaged. Psst, if it already is, then you need to moisturize damaged hair. Apply conditioner, followed by oil on dry hair. The oil seals the moisture from the conditioner. Keep it onfor 30 minutes (or as long as you can) and wash it away. Apply vitamin E and cover your hair with a scarf or a bandana. Keep it on overnight and wash it away in the morning. Speaking of vitamins, you need them for gorgeous gray hair, and you need to take them regularly, as vitamins promote healthy hair growth. Vitamin C helps build collagen that repairs tissues on your skin and hair. B vitamins, such as biotin and vitamin B-complex, protect hair against dryness. Vitamin A, although known to promote eye health, has antioxidants that are vital for healthy hair. Vitamin E is best known for promoting healthy skin but also enhances blood circulation, which will help with hair growth as well. Take a supplement. Remember that popping supplements without a balanced diet is not OK. So, include several portions of fresh fruit and veggies in your daily diet and stay hydrated to get beautiful gray hair. What has worked for you? Do you have any tips for women with gray hair? Share your ideas or comment below.